Additional research provided by Patricia L. Pertalion. North Carolinians have a wide variety of musical festivals to choose from. Jazz and bluegrass performers appear most often on the festival track, though other types of music fill the calendar. MerleFest, held each April in Wilkesboro, is arguably the most recognized music festival in the state, showcasing dozens of traditional acts each year on numerous stages. Named for Merle Watson, son of North Carolina music legend Arthel "Doc" Watson, MerleFest typically draws top performers from the world of folk, bluegrass, and American roots music. Informal jam sessions in the campgrounds and parking lots surrounding the stages are also a highlight of the event. But North Carolina is also home to countless smaller music festivals that celebrate its musical heritage. Among the oldest and best attended are fiddler's conventions in Jefferson, Union Grove, and Mount Airy. Each spring brings the Carolina Jazz Festival to the campus of UNC-Chapel Hill. The weekend celebration presents top-billed national artists and student ensembles, as well as a competition for local high school jazz bands. In nearby Durham, Duke University plays host to the North Carolina International Jazz Festival, and the St. Joseph Historic Foundation sponsors the Bull Durham Blues Festival. Both attract top performers from all over the world. Down-tempo and down east is the Cape Fear Blues Festival, which has drawn aficionados to Wilmington for more than a decade. During the multiple-day event, visitors can participate in workshops, take a riverboat Blues Cruise, or listen to a variety of live performers. North Carolinians flock to many food-based festivals as well; the most popular inevitably feature barbecue. The largest of these events is the Lexington Barbecue Festival, started in 1984 by Joe Sink Jr., publisher of the Lexington Dispatch. Festival pitmasters routinely serve more than a dozen tons of barbecue to thousands of guests. Hillsborough Hog Day, founded in 1982 by the Hillsborough/Orange County Chamber of Commerce, features activities ranging from guess-the-weight-of-the-pig to family games and musical performances. The state also offers numerous nonbarbecue food gatherings. Pamlico County's Croaker Festival started almost 30 years ago when the Oriental United Methodist Church held a fish fry as a fund-raiser. The festivities begin with a street dance on Friday night, followed by fireworks on Saturday evening and worship-themed events on Sunday. The church still holds a fish fry using the croaker variety. The Sneads Ferry Shrimp Festival has taken place in the small eastern North Carolina town for more than 35 years. Each year a winning dish is selected from the offerings entered in a competition, and a Miss Shrimp Queen and Junior Miss Shrimp Queen are crowned. Other long-established food celebrations include the Winterville Watermelon Festival and Ayden Collard Festival in Pitt County and the Maggie Valley Big Red Chili Cookoff in Haywood County. 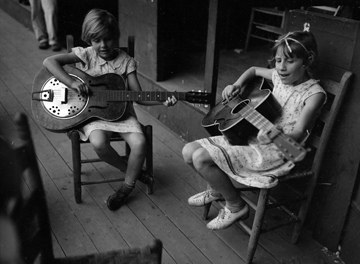 Mountain Music Festival, Asheville, NC, September 1938, photo taken by Baker. Conservation and Development Department, Travel and Tourism Division Photo Files, North Carolina State Archives, call #: ConDev1454A . Available from http://www.flickr.com/photos/north-carolina-state-archives/2387463859/ (accessed June 15, 2012). 1 January 2006 | Baker, Bruce E.